Helping schools find prospective families and develop data-driven enrollment strategies. Members of the National Association of Independent Schools needed an elegant, data-driven resource, and a partner that could be flexible in delivering the new system. 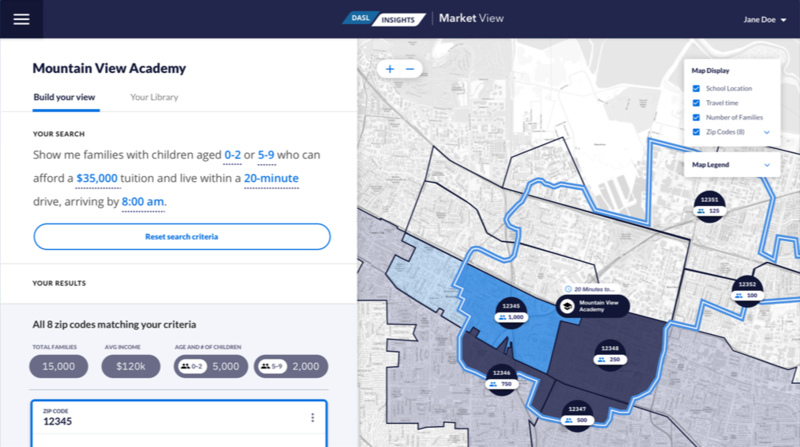 After a research period to understand who would be using the new enrollment system and their roles and responsibilities, DockYard was able to design a tool users could access to discover information within school districts. DockYard Design organized content in a way that is digestible and clear, prioritizing features such as saving and sharing reports, but ensured the tool still felt familiar and comfortable. It incorporated the existing NAIS brand colors and visual identity to position the organization as a trusted name with innovative, new capabilities, while integrating natural language filtering and accessibility best practices. DockYard designed the interface to be balanced and easy to understand. Prompting NAIS members with regular feedback ensures clarity and reinforces behavior. 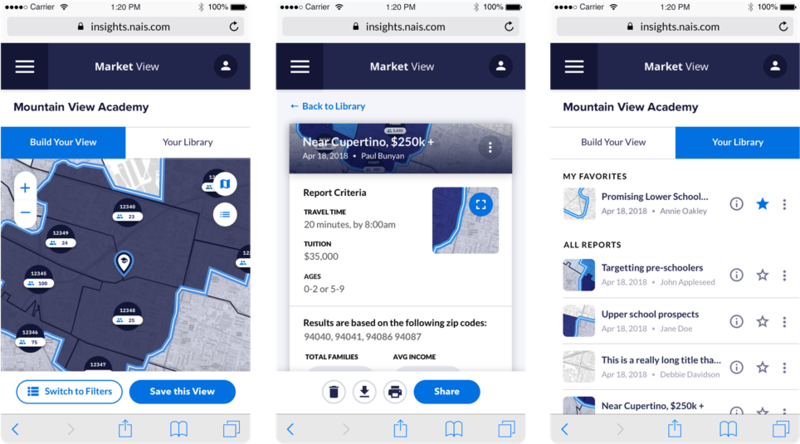 Market View required integration with a robust third-party Geographic Information System (GIS): ArcGIS by Esri. 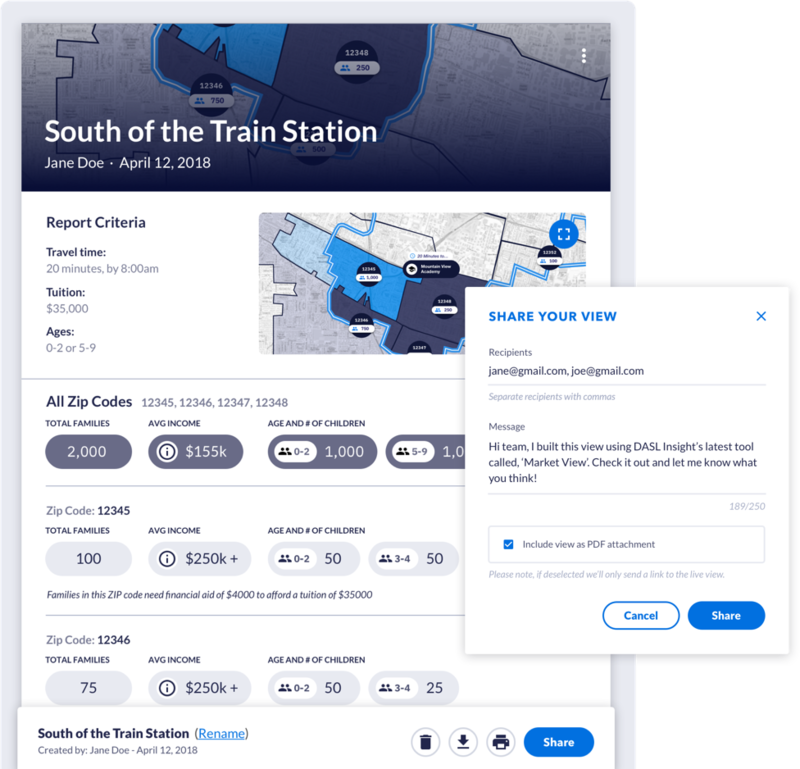 This system made available a multitude of powerful geographic and demographic data sets that DockYard leveraged to help users identify key market opportunities in the Market View application. 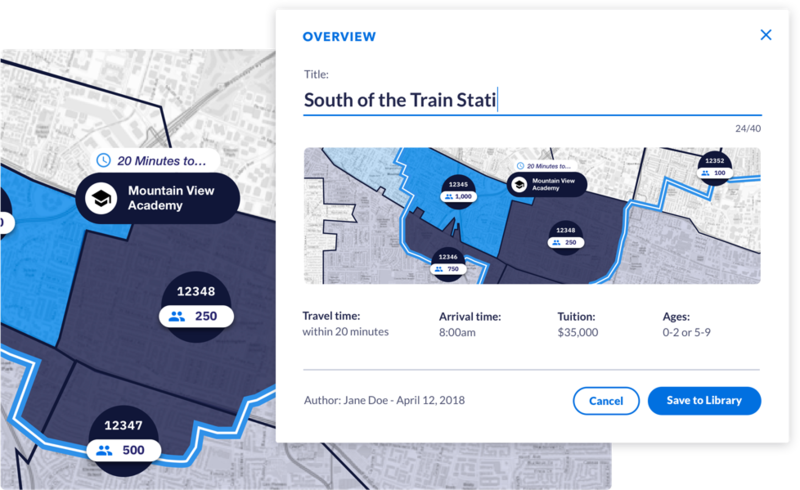 Given user-defined search and filter criteria, DockYard devised a strategy for querying, distilling, and rendering the compiled data on a map in a way that effectively worked around the limitations of the GIS API while minimizing performance impact. The solution allowed Market View users to access complete and relevant data, enabling them to garner insights about prospective students and to reliably generate reports that could be shared with other school members. DockYard built a single, responsive web app for seamless use between mobile and desktop experiences. DockYard’s solution was optimized for quickly sharing data and insights, as well as engaging teams, from the board of executives to the heads of member schools. This allows members to collaborate and tell meaningful stories about the students in their regions, further enriching enrollment strategies.